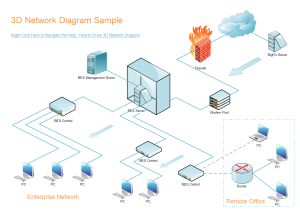 Creating 3D network diagram with free templates and examples. 3D network diagram has never been easier. A network diagram is a schematic representing the nodes and connections amongst nodes in a computer network or, more generally, any telecommunications network. There are many types of network diagram including 3D network diagram, basic network diagram, logical network diagram and among which,3D network diagram is a network diagram with a 3D look. 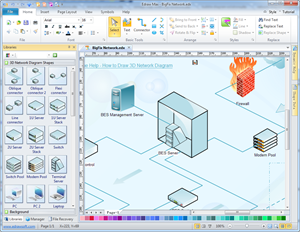 Edraw Max is a vector-based network diagramming software. It has a large collection of 3D shapes and smart connectors, which allows you to immediately build a 3D Network Diagram. With the intuitive interface and automated tools, it is easy for you to design and customize your diagram. The drag and drop function makes the drawing really fast. You can finish a 3D diagram in just minutes. 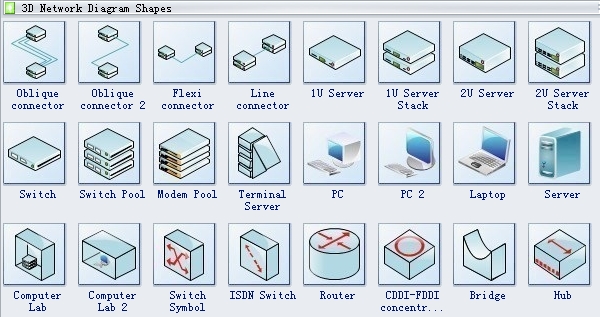 Edraw software provides you plenty of 3D network diagram shapes, oblique connector, flexi connector, line connector, 1 U server, modem pool, terminal server, laptop, router, bridge, hub, gateway, firewall, ring, Internet, Internet cloud, curved connector, etc. All these shapes will greatly help you when drawing the 3D network diagrams you need. An exquisitely made 3D Network Diagram example is offered in vector format. You will save lots of time by starting with this ready-made template.